The Fomalhaut system contains a cleared ring (shining brightly in this image) in the dust around the star. Scientists suspect that this gap was cleared by a pair of terrestrial planets, but new research reveals that the presence of gas could also create such a breach. Ring-shaped gaps in the gas around a newborn star system can trick astronomers into thinking that baby planets are forming there when they actually aren't, scientists say. New simulations show that a sufficient concentration of gas in the disk around a young star could cause the dust to clump together to form rings, creating paths that resemble those cleared by newly formed exoplanets. "Directly imaged planets are among the hardest to find," said Wladimir Lyra, of NASA's Jet Propulsion Laboratory. "One solution is that they may simply not be there." Spinning disks of dust and gas give rise to newborn stars. After the stars are formed, the remaining materialcan continue to collapse to create new solar systems. "Disks start as a mixture of usually 100 times more gas than dust," Lyra told SPACE.com in an email. "When the star is formed, its light will slowly evaporate the gas, taking around 10 million years to dissipate it completely." Lyra and colleague Marc Kuchner of NASA's Goddard Space Flight Center studied how the gas and dust within these disks might interact by creating two- and three-dimensional models of such systems. "The dust heats the gas by the photoelectric effect — an effect explained by Albert Einstein back in 1905 in a landmark paper that eventually led to the development of quantum mechanics," Lyra said. Gaps in the disk of dust surrounding the star Beta Pictoris, as shown in this artist's illustration, could have formed by a growing planet, or could have been created by the presence of gas in the system. As energized photons from the star collide with dust grains, electrons may be knocked from them. When these electrons bang into a passing gas molecule, it increases the kinetic energy and raises the temperature of the gas. The heated gas, in turn, causes the dust to concentrate into a series of rings. Unlike dust, gas tends to expand as it is heated. The inner, star side of a ring of gas accelerates inward as the pressure and gravity work together. "The dust is then being outpaced by the gas," Lyra said. "It feels a tailwind, pushing it outwards." On the distant side of the gas, the opposite effect occurs: The expansion pushes the gas outward, causing it to slow down. "The dust is then outpacing the gas," Lyra said. "It feels a headwind, pulling it inward." The heated gas concentrates the dust into a series of small rings. "From a distance, many such rings can combine to give the impression of a continuous ring," Lyra said. He compared the creation to the rings of Saturn, a grouping of thousands of ringlets that appear to be only a few. Such formations would occur only in thinner disks of dust and gas, where starlight could directly hit the dust grains and excite their photons. Thicker disks would block the light and shut down the process. The research was published online today (July 10) in the journal Nature. In 2008, astronomers using the Gemini North telescope and the telescopes at the W. M. Keck Observatory, both at Mauna Kea in Hawaii, captured the first direct images of alien planets, including three around the star HR 8799 and one around the star Fomalhaut. But such snapshots are rare. How, then, can scientists confirm if rings around a star are created by newborn planets or by pushy gas? "A clear separation between gas and dust would be the telltale signature," Lyra said. Studies of systems where gas drove the separation between the rings would reveal hot, thin gas among the dust rings and cold, dense gas gathered between them. 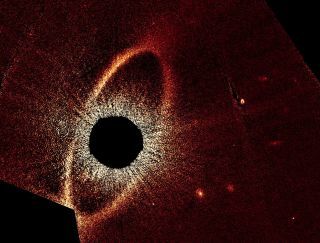 Fomalhaut contains one confirmed planet, but gaps in the clouds of dust around the star have led astronomers to suspect the existence of a pair of terrestrial-mass planets too small to be found with current instruments. According to Lyra and Kuchner's research, detecting the amount of gas inside of systems like Fomalhaut could help astronomers determine how likely it is that such planets exist. "A disk cleared by growing planets would not have a clear separation between gas and dust," Lyra said. "It may not even have gas at all."